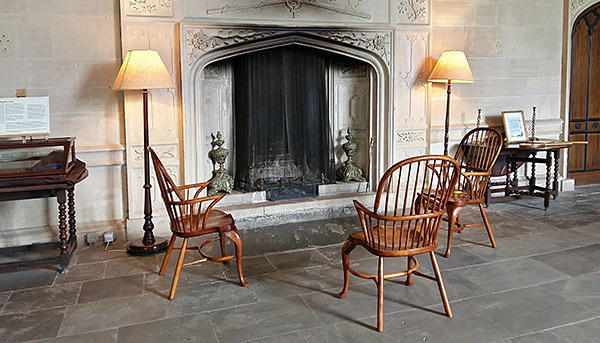 Supplied to the National Trust a few years ago, it was great to see on a recent visit, our fruitwood cabriole leg stick back armchairs (nicely mellowed) displayed in the Great Hall of Lacock Abbey. Lacock, in Wiltshire, was founded in the 13th century, as an Augustinian nunnery. It was seized in the 16th century, by Henry Vlll, during the dissolution of the monasteries, and sold to Sir William Sharington, one of his courtiers, who then converted it into a house. Much of the estate has been widely used for film work (including Wolf Hall and Harry Potter), and The Great Hall, although it was actually built in the mid 18th century (in the Gothic style), has been used to portray Henry Vlll's bedroom and banquet room.